Can I request a quotation for hydraulic or pneumatic components or parts? No. Our current focus is publishing world-class information products on hydraulics and pneumatics. A complete list of our home-study courses, books, ebooks, videos and tutorials is available here. Can you send me a printed catalog and price list? You can get all the details on our home-study courses, books, ebooks, videos, reports and tutorials on hydraulics and pneumatics right here. PLUS - there's a huge amount of hydraulic and pneumatic component manufacturers' technical information available in our Product Library and an extensive list of 'HOW-TO' articles and tutorials on hydraulics and pneumatics available in our Technical Library and on our Blog. Many of the documents in these two sections of our Web site are available in Adobe 'PDF' format, so they are easy to print or save to your hard drive for future reference. Do you purchase surplus hydraulic and pneumatic components? No, we don't buy surplus inventory. If your question is not answered above, send an email to: info@hydraulicsupermarket.com and we'll do our best to respond within 48 hours. 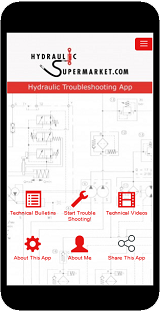 The Hydraulic Troubleshooting App is a nifty tool to keep on your phone or tablet, so you can refer to it when needed. And you will need it at some point, that's for sure. It's FREE. And it's available for download now from Google Play and Apple's App Store. So get yours today.